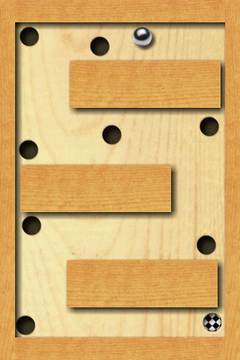 Labyrinth is the classic game where you control a steel ball by tilting a wooden labyrinth. It is available for iPhone/iPod touch and Android. The full version of Labyrinth has over 800 levels and is controlled by the accelerometer with high accuracy. Labyrinth has been downloaded more than 5 000 000 times (Yes, 5.0 million!). The full version of Labyrinth is on the App Store now. If you want to try it out for free you can get Labyrinth Lite Edition first. Thanks to all the people who are sending in feedback and are encouraging us to continue development. Special thanks to Rod Ferguson for creating lots of nice levels and beta testing. Labyrinth was created by Illusion Labs. If you like the game please buy the full version so we can make Labyrinth even better!